Oh, Denver... our NFL nemesis city (go Bolts). We visited the Mile High City in July of 2008 for a work conference. We didn't know much about the city besides the Broncos, Nuggets, and Rockies. 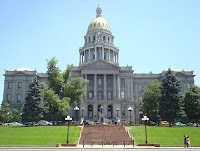 However, after doing some research, I found that the Denver Mint, State Capitol Building, 16th Street Mall, LoDo (lower downtown) and Elway's in Cherry Creek were a few places that I wanted to visit. We only stayed a couple of days here, so there wasn't much time to really go out and sight-see. Upon arrival at the Hyatt Denver Regency, we ventured out to the 16th Street Mall for lunch. It's not an actual brick & mortar mall, but 16 blocks of restaurants, fast food joints, and retail stores. It reminded of 3rd Street in Santa Monica, CA. Tons of tourists, locals, and teenagers like to hang out here. Of course, we like to avoid the popular chain restaurants, so we stopped at the Rialto Cafe to see what goodies they can offer us. The restaurant was dark and pretty quiet. There were a few people at the bar, and hardly anyone in the main dining room. Still, we gave it a try, and we were glad we did. 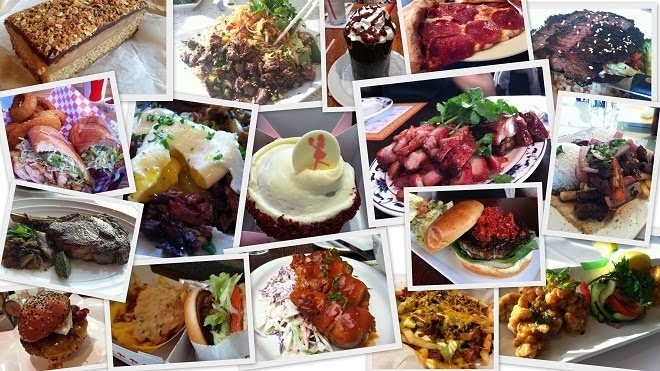 Yum in the tum... 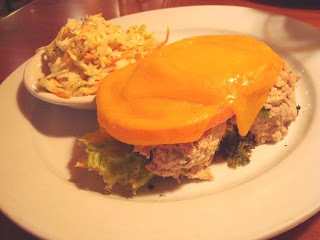 I ordered the Tuna Salad Melt and a side of cole slaw. The melt came with juicy tomatoes, avocado slices, Tillamook cheddar cheese, on a grilled French baguette. I loved how the cheese melted over the tomatoes. 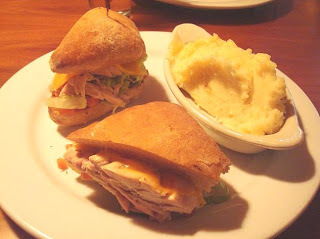 Mike had the Warm Roasted Chicken sandwich with a side of creamy whipped potatoes. The sandwich came with sundried tomato pesto, romaine lettuce, cheese on a toasted ciabatta roll. Overall, the lunch was delicious, and we liked our server who gave us tips on what to do in Denver in terms of nightlife. He's a DJ and he mentioned the Church, this popular club. Unfortunately, our clubbin' days are over, but that was nice of him to tell us about it. When we took the LONG bus shuttle ride from the airport to our hotel, we passed by a restaurant that looked interesting to me called the Rocky Mountain Diner. First of all, in San Diego, there's only one real diner that I know of, Studio Diner, so seeing the word "diner" on a sign made me want to go. I did research on the hub's laptop in the hotel room, and it was walking distance - yay! The website states that Rachael Ray was here in 2006 filming "Tasty Travels"- haven't seen it, guess I missed it! 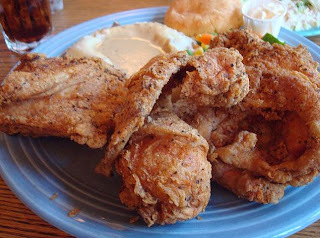 I found the best fried chicken I've ever had - move over Roscoe's Chicken & Waffles. It's here at the Rocky Mountain Diner, where their motto is "Nothing could be finer than dinner the Diner!" (sound familiar? Think Bubble Boy on 'Seinfeld'). I ordered the famous Pan Fried Chicken with mashed potatoes & cracklin' gravy, mixed vegetables, fresh biscuit & honey butter, and Nana's slaw. It takes 25 minutes to cook, and I had no problem kicking back and waiting for the crispy half chicken to greet me at the table. It melted in my mouth because the meat was so juicy and the skin was so crisp. 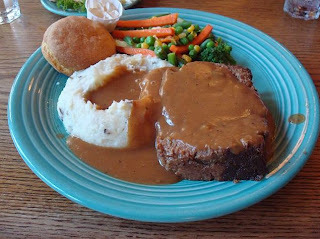 The hub got the buffalo meatloaf with brown onion gravy, mashed potatoes, mixed veggies, biscuit, and a salad. He made it a combo meal because he had some of my pan fried chicken too. I know, we could have shared! Every bite was delicious. 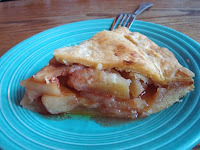 We each had a Stewart's soda, root beer for me and grape soda for him, to wash it all down and shared a slice of freshly baked apple pie for dessert. Sam's No. 3 is another joint that we noticed as we walked the city. It also looked like a traditional diner because it got my attention with all the vibrant colors. We came here for a light lunch on our last day in Denver. They are known for their breakfast, not to mention their fabulous weekday early bird specials before 10:00 AM. As you can see, Sam's No. 3 has been here for quite a well, since 1927. It was very busy for lunch, and we had to wait about 10 minutes for a table. 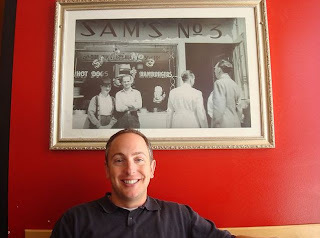 The restaurant had lunch counter, a soda fountain, booths and tables galore. 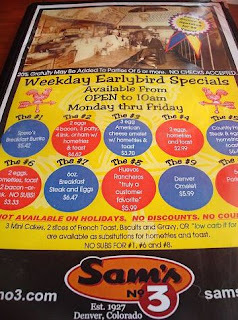 I loved the vibrant energy of Sam's. I was craving something simple, but comforting. Sam's No. 3 prides themselves on their Red No. 3 Chili, and on their Coney Island specials. I ordered a Coney Dog that came with an all-beef dog, their Red No. 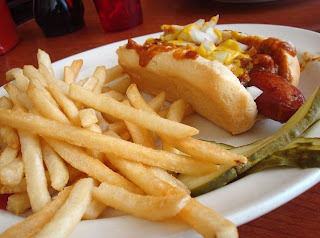 3 chili, onions, and mustard with a side of french fries. My husband loves breakfast at any time of day, including dinner. 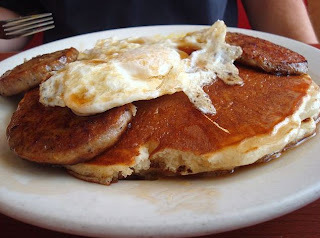 He ordered the Pancake Sandwich, which came with two eggs (over medium), two buttermilk pancakes, and three sausage patties. I love this picture. Not only because of my husband, but it's a photo of Sam's No. 3 back in the days. Our final dinner in Denver, CO, consisted of a cab ride to Cherry Creek, CO with Cory, our co-worker friend to Elway's, John Elway's steakhouse. 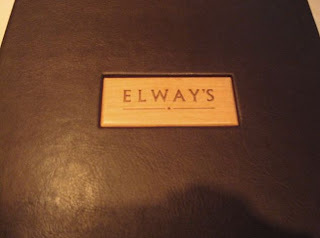 There's an Elway's restaurant in downtown where we were, but we wanted to visit the original on our last day. We arrived before the dinner rush started. Our friend, Kevin, is a huge Broncos fan, so we wanted to get him a souvenir from the restaurant, maybe a pic with John Elway himself? J/K - unfortunately, he wasn't there. Cory and I both had the Smash Burger, cooked medium with all the fixings, red onion, tomatoes, pickles, and romaine lettuce. The bread tasted fresh, and the ground beef patty was perfectly cooked and well seasoned. We all shared the traditional steakhouse side dishes of au gratin potatoes, macaroni & cheese, and sauteed asparagus. Delicious. 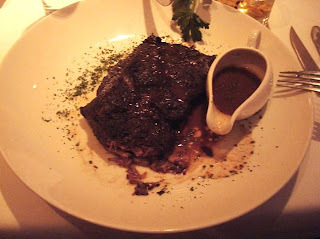 Mike had the 'fall off the bone' short rib. It's not the best picture of it, but it was so moist and flavorful. 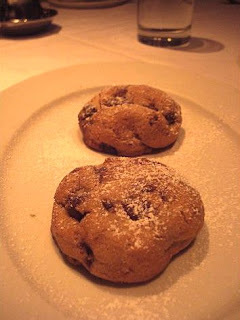 For dessert, I had the warm chocolate chip cookies. Oh, so yummy! It was under-baked so that it was chewy in the middle and the chocolate chips were still warm and melting. 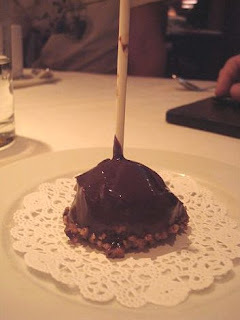 Mike had the cheesecake lollipop. It was the perfect bite and just enough to satisfy his sweet tooth after dinner. Elway's was worth the short cab ride to Cherry Creek. 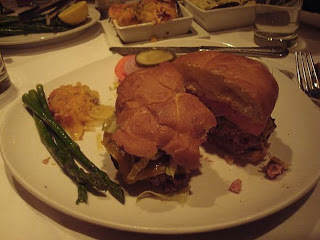 The food was top notch, and we think that John Elway should give himself a great big pat on the back. It was a quick, satisfying trip to the Mile High City. I'd love to have that pan fried chicken once again. With that, see you next time, Denver!